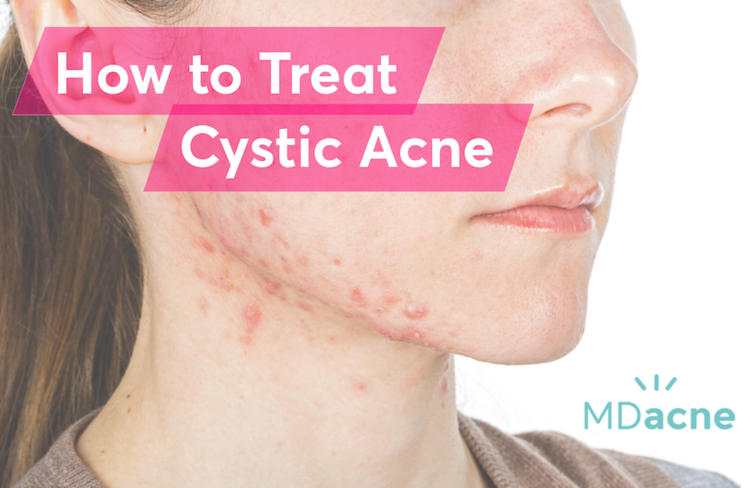 Cystic acne is the most severe type of acne. Untreated, the condition can last for years and leave behind permanent physical and emotional scars. Fortunately, most people with acne have mild to moderate acne that can usually be controlled with an effective topical acne treatment. However, roughly 20% of people with acne who experience severe cystic acne often require additional therapies to achieve clear skin. An acne cyst is a small “sac” under the skin, in which there is an excessive build-up of sebum (i.e. ), bacteria, and dead skin cells. Inflamed tissue with enlarged capillaries usually surrounds this "sac" causing them to protrude from the skin. Cystic acne lesions are most often felt beneath the skin before they’re seen. Nodules: A nodule is hardened cysts. In nodules, the fluid is replaced with scar tissue. Post-acne nodules can persist for weeks and months. There are several causes of acne, which include genetic predisposition, hormonal changes or imbalances, and external factors such as certain medications, stress, and diet, and use of the wrong skincare products. All acne starts when the opening of the skin's oil glands are clogged and accumulate sebum (skin oil). The increase in the number of acne bacteria in these enlarged, clogged oil glands triggers inflammation and in turn, lead to typical acne pimples. Cystic acne develops when the inflamed sebaceous (i.e. oil) gland ruptures. 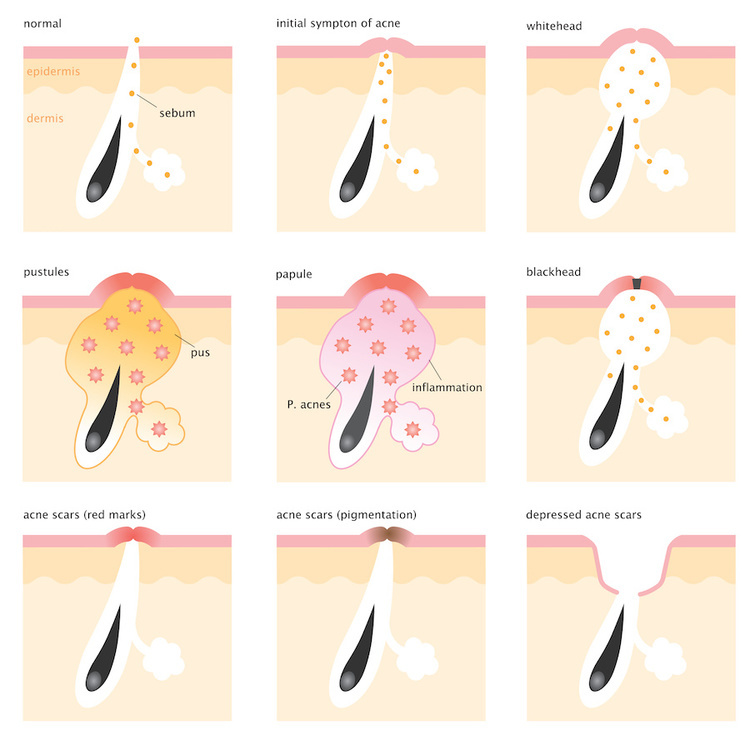 When the wall surrounding the sebaceous gland ruptures, bacteria and sebum spread to the surrounding tissue, causing a bigger infection that results in significant, painful inflammation. Unfortunately, in many cases, this damage can lead to long-term or even permanent acne scars. Severe and cystic acne can cover the face, chest, and back. It can also spread along the jawline and neck and even armpits and buttocks. How Prevalent is Cystic Acne? Acne is the most common skin disorder, affecting 7% of the population (50 million people in the united states ). Moderate to severe acne is present in about 20% percent of young people. According to the CDC, Cystic acne affects 0.2 % of the population of people with acne, equating to roughly 100,000 people at any given moment of time. Cystic acne can also run in families. Some estimates claim heritability is almost 80 percent in first-degree family members. What are the Psychological Effects of Cystic Acne? Cystic acne can cause profound negative psychological and emotional effects that should not be taken likely. Studies have found that up to 50 percent of adolescents face psychological difficulties due to their acne. Many people with cystic acne report lowered self-esteem, increased anxiety, and even depression with additional negative impacts on social life, education, and employment. As with any type of acne, it is best to start a medicated topical skin care treatment right away. A good skincare routine should include a medicated cleanser, treatment cream, and moisturizer with active ingredients (salicylic acid and/or benzoyl peroxide) to help unclog the skin's pores, remove excess oil, and kill the acne-causing bacteria. While there are many over-the-counter acne products available, it is important that an acne patient uses treatment products (antibacterial and anti-inflammatory) in the right formulas and concentrations for their acne severity, skin type, and sensitivities to ensure efficacy while minimizing irritation. --> to find the right acne treatment products for your unique skin, take the free MDacne skin analysis. Antibiotics: Antibiotics work by killing the bacteria and calming the inflammation that contributes to acne. Although useful for the short term, oral antibiotics do not have a long-term effect and will usually not “cure” cystic acne. Oral antibiotics also have some nasty side effects. Changing the normal flora of the gut, oral antibiotics (minocycline and doxycycline) are frequently associated with increased abdominal pain, diarrhea, and nausea, and can cause bacterial resistance, which can make your acne worse in the long run. Isotretinoin (Accutane): Accutane (a derivative of vitamin a) is the single most potent drug used today for treatment of acne. It is highly effective in even the most severe cystic acne treatment. About 70% of patients see permanent clearing after one course of isotretinoin, and the rest will be acne-free for many years. Due to possible side effects, you will need to consider whether you want to take this medicine carefully. If you decide to take isotretinoin, you must enroll in an ongoing monitoring program. Birth Control Pill (Females Only): Birth control pills containing both progesterone and estrogen can result in a decreased level of androgens in the blood. The fewer androgens produced, the less sebum secreted. With sebum production under control, the likelihood and severity of breakout are decreased. Birth control pills that only contain progesterone should be avoided, as these can often make acne worse. One should also keep in mind that birth control pills (oral contraceptives ) can also have side effects; blood clots, weight gain, nausea, spotting, and mood changes. To learn more about the best birth controls to treat acne, click here. Spironolactone (Females Only): Spironolactone (Aldactone) is an oral drug created to treat hypertension. This drug is an androgen (male hormones) blocker; as it disrupts the production of androgens, sebum production is decreased, which can result in fewer acne breakouts. As it is a diuretic, it can cause an increase in the level of potassium in the blood. Are There Any Dermatologist Office Treatments for Cystic Acne? As acne cysts are deep within the skin, squeezing or attempting to self-extract these lesions can worsen the condition, slow down the healing process, and heighten the risk of permanent, deep scarring and hyperpigmentation. One way your dermatologist can get rid of a painful cyst or nodule is to inject it with a corticosteroid. The Benefits of Cortisone Injections: Intralesional steroid injections for cystic acne can help reduce the size and pain of cyst and promote healing much more quickly. 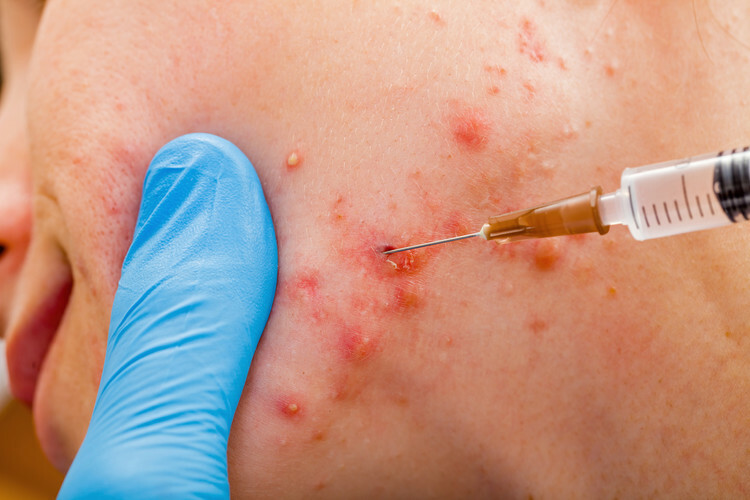 After an injection, the acne cysts will shrink within eight hours and improve in several days. Larger cysts can also be incised (sliced open) and drained if necessary. This procedure should be done only when the cyst is large very painful and should be performed only in sterile medical office conditions by a licensed physician. Possible Side Effects of Cortisone Injections: While cortisone injections help with existing cysts, they do reduce existing bacteria and therefore do not help with the prevention of future cysts. They can also sometimes cause side effects, the most common of which is a "pitting" in the skin. However, these typically heal on their own.